Bret Lesh, Ekalaka, Mont., at the Bar 69 Angus sale. 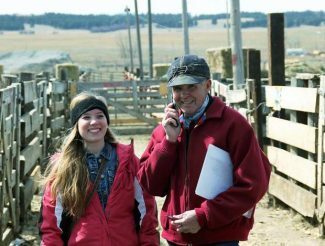 Callie Kukuchka and her dad Craig were gracious hosts for the 27th Annual Bar 69 Angus sale. John Sletten, Sletten Angus, Faith, S.D., and Chris Smith, Smith Cattle, Milesville, S.D., at the Bar 69 Angus sale. 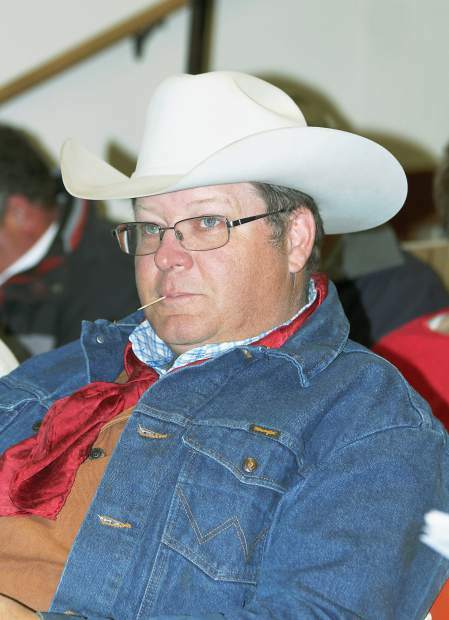 Location: Belle Fourche Livestock Auction, Belle Fourche, S.D. 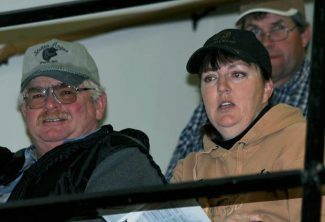 Bar 69 Angus Ranch, owned by Craig and Deb Kukuchka and daughter Callie held their 27th Annual production sale at Belle Fourche Livestock Auction Apr. 2. At Bar 69 Angus, they develop the bulls in large lots on a high roughage ration to express their genetic potential and ensure soundness and longevity. These bulls were in sale condition but not over fed. They are ready to go to work in the breeding pasture. Bar 69 Angus Ranch has an intensive artificial insemination program and only utilize proven sires that have balanced numbers for all traits. Nearly 90 percent of the sale offering in this sale was AI sired. Topping the sale was lot 4103, Bar 96 Thunder 4103, a Feb. 2014 son of Connealy Thunder and out of a first calf Sitz Missing Link daughter. This calving ease bull was long, thick, clean fronted and posted epds of CED 10 BW -0.7 WW 50 YW 92 Milk 30. Six Creek Farm, Ekalaka, Montana, was the buyer at $11,000. Six Creek also got lot 4170, Bar 69 Final Answer 4170, another calving ease bull born Mar. 2014 and sired by SAV Final Answer 0035. This bull has epds of CED 11 BW -0.9 WW 53 Milk 24 YW 90 and sold at $10,500. Selling at $10,000 to Smith Cattle, Milesville, S.D., was lot 4100, Bar 69 Final Answer 4100, a Jan. 2014 son of SAV Final Answer with epds of CED 17 BW 4.2 WW 50 Milk 22 YW 88. Lot 4118, Bar 69 Upward 4118, a Mar. 2014 son of Sitz Upward 307R with epds of CED 12 BW -0.8 WW 56 Milk 30 YW 103 sold to Bret Lesh, Ekalaka, MT for $10,000. Rounding out the top bulls also at $10,000 was lot 4149, Bar 69 Upward 4169, a Mar. 2014 son of Sitz Upward 307R with epds of CED 5 BW 0.8 WW 55 Milk 32 YW 95. Colter Ellsbury, Sundance, Wyoming, was the buyer.